The Albanian Greek-Catholic Church (not to be confused with the Byzantine Italo-Greico-Albanian Church) is a Church sui iuris of Eparchial status, but is formally sine episcopi (without hierarchy) at this time. The Church was instituted in 1660, when a group of Albanian Orthodox faithful, led by their hierarch, entered communion with Rome. In 1692, the Archeparchy of Durres of the Byzantine Albanians was established, but was canonically suppressed in 1816 on the death of Archbishop Giuseppe Ageluni, OSBM, of blessed memory. The remaining mission became dormant within a quarter century thereafter, due to Turkish intervention. An effort to erect a canonical jurisdiction in 1895, after another group of Albanian Orthodox entered communion with Rome, failed because of objections posed by the civil authorities. 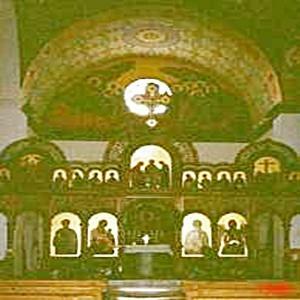 The present-day Church is ordinarily dated from 1900, when an Albanian Orthodox archimandrite, Father George Germanos, of blessed memory, was received into communion , together with his congregation. Four decades later, in 1939, an Apostolic Administration was finally established. However, in 1945, it was civilly suppressed by the Communist government, a situation that persisted until late in the twentieth century. The jurisdiction was reconstituted in 1996 and, presently, the Church is canonically organized under it, styled as the Apostolic Administration for Southern Albania (Albania Meridionale). The Church has no organized presence in the diaspora; all Albanian parishes outside the country are national parishes serving according to the Latin Rite. A photograph of the Servant of God Papa Josef Mihali accompanies the link to listings for this Church. Papa Joseph, a priest of the Apostolic Administration, was arrested by the Communists in 1948 for the crime of conducting religious services and refused demands to renounce his Church. On 26 October 1948, after suffering beating and torture, he was martyred in odium fidei by being submerged, alive, in the swamp adjacent to the extermination camp at Maliq, Kosce, Albania. His Cause for Beatification is presently before the Sacred Congregation for the Causes of Saints, together with those of 39 other martyred Latin and Byzantine Catholic Albanian clergy, religious, and laity.